This is my first ever-attempt in an Alsace. What's this "nerf" I've been hearing about? Alsace has definitely been NERFED! I just got Alsace a couple of days ago, and it seems promising. I never played it before the nerf, so I don't know if it feels any different. After just working up the German BB tree to Bayern, the 32 second reload feels a bit slow, but not a big deal. 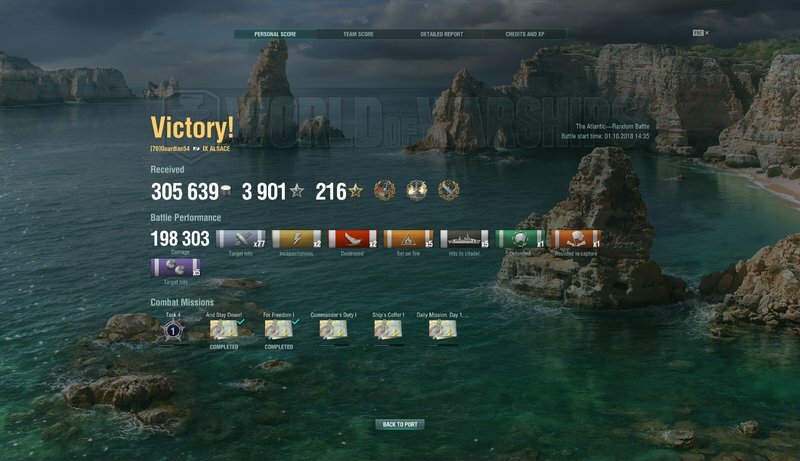 I ended up in one match where the red BBs all had heavy armor (Yamato, Montana, Missouri). I tried sticking to AP, just to see what it could do. Pumped several salvoes into a Yamato, which was slightly angled. Damage was disappointing. Next time HE spam. They loaded stats for Bourgogne in Wiki. It looks identical to Alsace, except main guns have 28 second reload instead of 32 seconds, and an extra 4 km of range. Higher max dispersion, but I think that's a function of the longer range, and it probably has the same dispersion as Alsace at lower ranges. Still 380 mm, so it's not going to penetrate armor any better. But a definite upgrade. I'm just hoping it's not going to be walled off behind some impossible clan or ranked achievement. The stock Alsace grind is even worse than stock Iowa, by dint of not being able to lolpen cruiser bows. 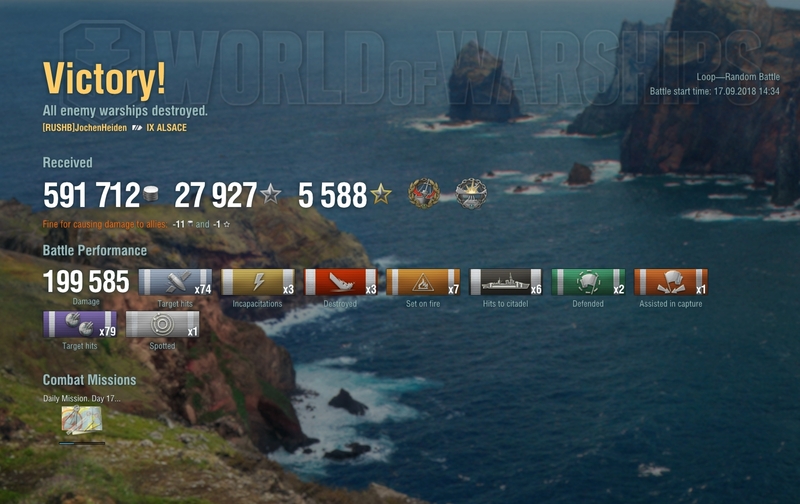 And then I pulled off another high cal + confed game in Yorck right after. And today I got a email warning me about misbehaviour in chat. Presumably some folks were buttmad I complained about the ships and then stomped their faces in with them??? If you didn't play it pre nerf you don't know how much worse the accuracy is now. It was pretty bad before but now it is about as accurate as Stevie Wonder throwing rocks. I still like the ship and play it a lot but it definitely was nerfed and it made it a lot worse. It didn't need the nerf either. 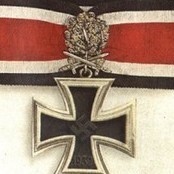 Just got the Alsace myself. Have noticed the "Aim Point" is the spot on the map (100 meters) where you don't want any of your shells to land. My Lyon must have had the same gunners. It was just a sigma (accuracy) nerf...still great bote, just not as consistent as it used to be. I finally have it fully upgraded. Wish I had played the ship in its glory days but, combined with RNG, the accuracy is horrible. So many wasted shots as my shells land all around the target. Just had a broadside Des Moines at 10K, pretty much stopped (reversing) and unloaded 12 barrels anticipating huge damage. Got one hit which at least it wasn't an overpen. Seems like most of the French BB line is spray and pray. It's almost like .1 sigma doesn't mean all that much in the grand scheme of things. So are you saying it was always about this bad? Then why nerf it at all? Especially since RNG hates the ship (at least it hates mine). Adding another example of RNG/sigma/dispersion hating me in this ship: Bismarck bow on at 7k. Also bow on to him with HE loaded so aim for his superstructure with my front turrets. Get 2, sort of tight shell groupings. One passes by his port side, one down his starboard for zero hits. At least my secondaries could hit him! Fortunately a team mate killed him before he could ram. Say wha....???? I don't consider any French BB above tier 5 or 6 to be 'spray and pray'... My best BB games are with the French line. Lyon and Alsace are definitely spray and pray. Riche and Repub are railguns. Alsace has my highest damage game of any of my BBs (just over the Republique) - never prayed after shooting the main guns of the Alsace. So you're the one taking using up all the good Alsace RNG!! Long range shots, short range shots, in any match I expect several full misses on well aimed shots. (not all my shots count as well aimed) Remember you only get 39 max volleys in a game (effectively a lot less). When I do get a couple of hits and they are often shatters and overpens. Not all shots are all over the map (literally) but a high percentage are. Richeleiu was better than Lyon but had some pretty wonky accuracy too. Railgun is not a term I would use for the ship. Hoping it does apply to Republique though it competes with Yamato that does have them. 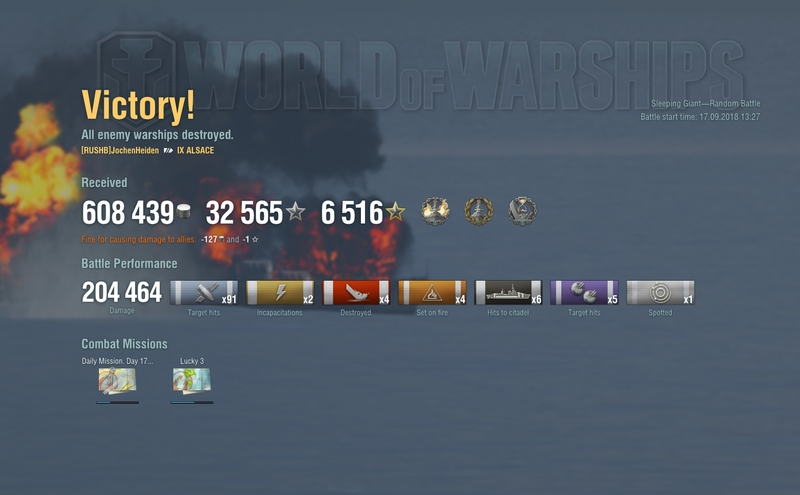 Alsace also has my highest damage game, 198K, but that was by sheer dumb luck and terribad enemy cruisers (DM and Minotaur yoloed B cap on Atlantic, I was behind island between A and B, out of torping range, with AP loaded as I'd noticed them rushing mid. The DM was bow-tanking my teammates... and the Mino was stationary in smoke. Needless to say I got lots of cits off them). This was followed by additional fighting where I had to sling HE on BBs since 45 degree shatter is RIDICULOUS. Alsace is just plain vicious! Just got out of a 4 kill; 145,900 damage game. 7 fires, 288 secondary hits. Half of those kills were from the secondaries: a Kurfurst, and an Alsace- both burned to death by my secondaries. The other 2 were cruiser squishes. I added a solo cap for extra added xp goodness, lol. It was there, I took it. Kurfurst ate 2 full broadsides of my AP right to his breadbasket for an ungodly number of normal pens before the fire my secondaries set killed him. Eddy took a full salvo through the nose and just blew up, lol. Balti sailed around an island- and right into my guns flat broadside. POP! Alsace just got hammered to death and burnt to a crisp by secondary fire. I had hammered his midsection 2 or 3 times from a distance, then he charged past me. And my 100mm gunners just went into a feeding frenzy! He cooked up nice! Weird MM: 4 BB's: Kurfurst; Alsace; Mass; and Monarch. All human. 4 cruisers: 2 Baltimores and 2 Edinburgh's all four bots. We spawned in double rows- cruisers in front, BB's behind- all nicely lined up.